Perhaps you would like to join me in praying this prayer following the prayers at evening (Vespers) each night. It echoes the theme of “keeping watch” with Christ. Watch Thou, O Lord, with those who wake, or watch, or weep tonight, and give Thine Angels and Saints charge over those who sleep. And all for Thy love’s sake. Renew in your Church, we pray, O Lord, that spirit with which you endowed your Bishop Saint Augustine that, filled with the same spirit, we may thirst for you, the sole fount of true wisdom, and seek you, the author of heavenly love. I am stimulated by what we ask the Lord: to be filled with the same spirit as Augustine, thirsting for Him and seeking divine love. Shortly into the papacy of Benedict XVI he went to pray before the relics of Saint Augustine in Pavia, Italy. When I saw this picture yesterday I immediately got to wondering why is Augustine so important to some, and irrelevant to others. Why does Augustine have such an crucial influence on us 1600 years after his death? The answer is still being formed but I think part of an answer is his capacity for friendship, and to relentlessly seek God. The Augustinians are meeting for their 184th General Chapter and Pope Francis opened the Chapter with Mass. Here is a report on the gathering of the Augustinians with His Holiness. BUT let me offer you an opportunity to hear what Saint Augustine’s spirituality is and how it is relevant to us today. I found a 2009 presentation on Augustinian spirituality given by Father Theodore E. Tack, OSA, who, at the time of his death in February (’13) been a professed member of the Augustinian friars for more than 60 years; he was the 93rd Prior General of the Augustinians, a headmaster, and until his death a high school teacher in Tulsa, OK. Tack gives a great overview of Christian life through the eyes of Saint Augustine. Father Tack’s presentation, “The Relevance of Augustine for Young Adults Today,” is a very good introduction to the person and perduring influence of Augustine of Hippo. 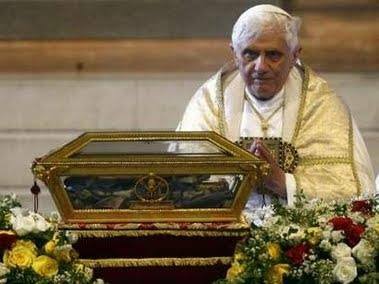 Like the Pope visiting the relics, we need to visit a man who has a profound influence on the Church. Don’t be fooled by the title; his presentation is really for all. He offered this work as the opening presentation for the Society of St Augustine at Villanova University. Saint Augustine was born in Tagaste, Souk-Ahras, Algeria on November 13, 354 to Patricius, a pagan, and Monica, a fervent Catholic. We liturgically observed Saint Monica’s feast yesterday. We know from his writings and the witness of many others that Augustine was endowed with brilliant human, intellectual and spiritual gifts which lead him on a wild pilgrimage of heart and mind. 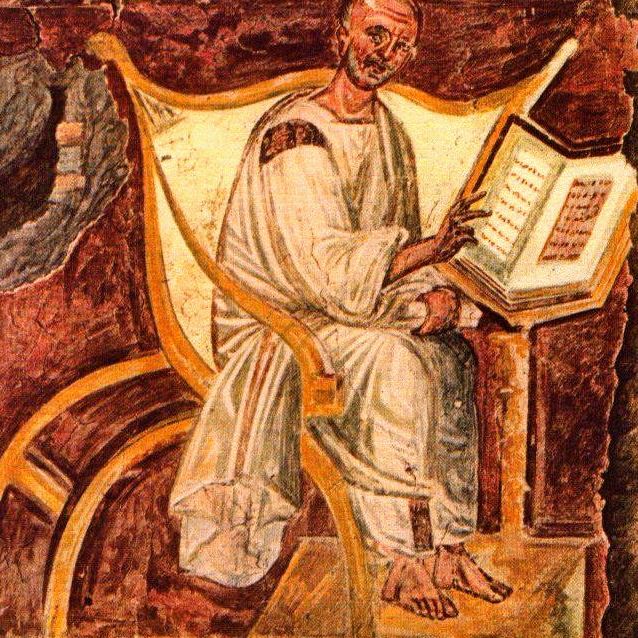 Following his education, Augustine was an accomplished rhetorician and teacher in Africa, Rome and Milan. His faith journey began with his mother Monica when he was a child but he didn’t complete his theological formation and wasn’t baptized for many years. In fact, he adopted the Manichean heresy as an intellectual lens to judge reality. But as we know from his Testimony, Augustine discerned moments of spiritual growth he decided to embrace Jesus Christ fully Catholic. By this time his common law wife named Una by scholars and who bore him a son, had departed. Conversion meant that marriage was not possible for him. The gift of Baptism was given him by Saint Ambrose in Milan in 387. It is said that together with his son and some friends, he returned with them to Tagaste to begin a monastic life. While the ministerial priesthood was not in his personal discernment, the Church had decided that Augustine’s vocation was to serve as a priest in Hippo in 391, and later a bishop of that See in 397. Augustine’s ordination was lived lived in the monastic context. Augustine was a prolific writer, an accomplished preacher, a monastic leader, a theologian, pastor, contemplative, and mystic. On this date in 430 at nearly 76 years of age, with North Africa being invaded by the Vandals and the Church devastated. Augustine mortal remains were first taken to Sardinia and later to Pavia, Italy, where they are now rest in the Basilica of San Pietro in Ciel d’Oro. Have you ever thought about the scriptural exhortation that “A sacrifice to God is a contrite spirit”? What does it mean? What does it mean for me? Why do I need a contrite (a feeling or showing sorrow and remorse for a sin or shortcoming) heart to be a person of faith? 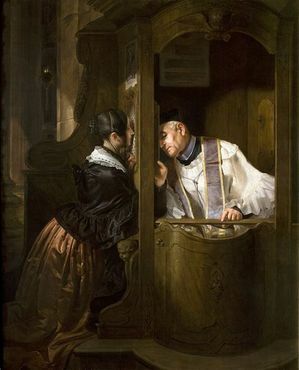 When I pray the Liturgy of the Hours, or approach the confession box my thoughts and feelings zero-in on contrition, sin and what it all means. Some days I am plagued by the heaviness of sin (separation from God but also living divorced from a good sense of self and relations with others). Here, I am talking about the place of mercy –God’s mercy– for me. The Responsory for a recent reading in the Office of Readings (Sunday, 14th Sunday through the Year) has us sing: My sins are embedded like arrows in my flesh. Lord, before they wound me, heal me with the medicine of repentance. A clean heart create for me, O God. Put a steadfast spirit within me. Heal me with the medicine of repentance. I found myself thinking about what Saint Augustine said about sin in one of his sermons. (The italics is Augustine using Scripture.) Perhaps the following portion of the sermon is of interest for you. The spiritual life, indeed, our whole personhood, needs to consider how we deal with sin in our lives. In case you heard a dreadful homily on the Holy Trinity today, you may rely on Saint Augustine. To be fair, this dogma is difficult to comprehend but we do have to give a reasonable explanation to what we believe. The Catholic faith is reasonable on all levels. In the sacred Liturgy, our first theology, we prayed and lived in the last weeks the mysteries some of the crucial pieces of Christian life and salvation: the Paschal Mystery — the life, death, Resurrection, the Ascension, the Pentecost– and today, the Most Holy Trinity, and soon Corpus Christi, the Sacred Heart and the Immaculate Heart of Mary. The teaching of the Church is that the Father created us, we are redeemed by Jesus (the Son) and sanctified by the Holy Spirit. The communio of the Persons of the Trinity demonstrates how we are to live and gives voice to what we aspire: life with God. The most important thing to understand about the Trinity is that God is not a solitary unit, but a community of persons: a community of Love. If God were a single person the love spoken of would be ego-centric. But what is revealed to us is the God is a community of three persons whose other name is Love (or, Mercy) and that Love is shared among themselves and with us. 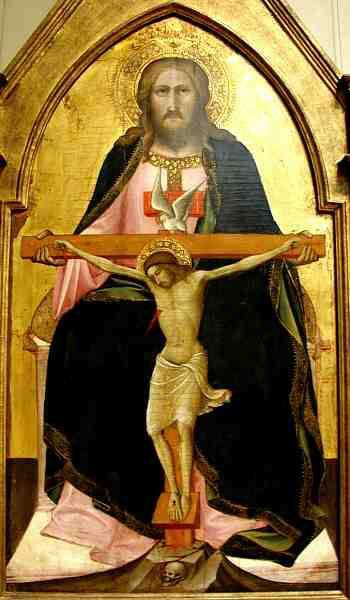 The communio of the Trinity is expressed and lived dynamically with others, that is, in relationship with others.